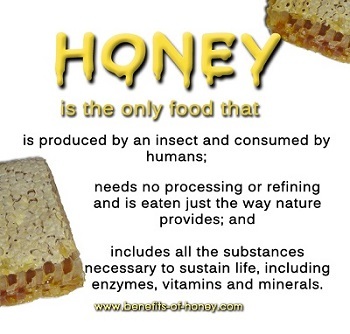 Eat honey, a good old-fashioned food designed by nature for us human beings! 1. Honey is the only sweetener that isn't man-made or processed and has antibacterial properties and many healing effects. 2. With about 18% water and a pH of 3-4, honey is very stable and can last for literally centuries when stored properly. 3. While empty calories from refined sugar contribute health issues and obesity, honey reduces fatty accumulations in our cardiovascular system. 4. Unlike refined table sugar or sucrose, honey does not ferment in our stomach to pose any danger of bacterial invasion. 5. Honey is a monosaccharide, the simplest form of sugar that cannot be further broken down, passing directly from the small intestine into the blood stream without causing any irritancy to our digestive system as sucrose does. 6. Honey is the most ideal fuel for burning our body fat stores during sleep due to its 1:1 ratio of fructose and glucose. 7. As the most superior burn treatment, honey relieves pain effectively and heals wound faster with minimal scarring. 8. Honey contains vitamins and antioxidants; in fact one unique antioxidant called "pinocembrin" found only in honey and a few other foods. 9. According to researchers, honey is a more effective and safer remedy for children's coughs than over-the-counter medicines. 10. Doctor D.C. Jarvis, author of "Folk Medicine" advised that mixing the apple cider vinegar with honey would enhance the healing power of the vinegar. 11. 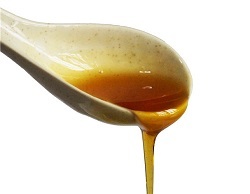 Anabolic honey, a concentrated source of fructose, glucose, is a preferred sweetener choice for athletes. End of "11 Most Unbelievable Honey Benefits That Many People Don't Know". Back to "In what ways have you experienced the benefits of honey?"